SOUNDING MY BARBARIC GULP! : What's With All The Ramp Hype? 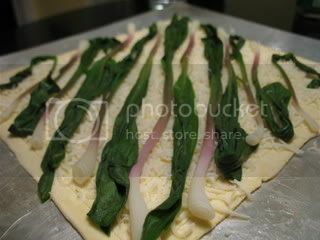 Over the past few weeks, I've seen ramps appear on many food blogs. People go crazy for these things...even more so than with morel mushrooms. Michael Nagrant called them the "agricultural version of crystal meth." He goes on to write: That’s not to say if you eat a handful of the green, leafy, white-bulbed veg that tastes like a cross between spring onion and garlic you’ll end up tweaked-out and toothless, selling your children in the Wal-Mart parking lot. But then again I’ve never smoked or snorted them. Maybe if you throw a couple of bulbs in some rolling papers and spark up, you’ll commune with the ghost of Julia Child and a Rockette-like dance troupe of truffle-stuffed chickens? What I do know is that wild leeks, like meth dens, pop up unchecked, usually in late March and early April, carpeting forested rural landscapes, and as a culinary signpost of impending spring bounty, they’re often farmed with the vigor of a hovering drug user. [...] Then there’s the addiction. Ramps are delicious. Yoshi Yamada, a former chef at Mario Batali's Babbo in New York, expresses similar affection for ramps in an article at Gourmet.com: In the dog days of winter, when my breath freezes as I exhale and the idea of spring seems like a cruel joke, there is something I begin to think about, then fixate on: a light at the end of an icy tunnel. Some cooks I know dream of tender asparagus; others fantasize about the sweetness of peas. I begin to dream of ramps. To me nothing announces the end of winter like the arrival of ramps. By this time of year I’ve spent too many mornings walking to the train with my hands shoved deep in my pockets to stay warm, gloves long since lost, root-vegetable crazy, pale and muttering to myself: Yes my precious, soon my precious, ramps will be here. I'd never eaten, or even heard of, ramps before. 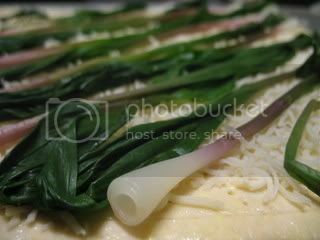 According to Slashfood, "the ramp, also known as the wild leek (Allium tricoccum), is a member of the onion family that grows wild along much of the Eastern Seaboard of the U.S. and Canada." Essentially, ramps are weeds that people used to ignore or work to kill off. Now, chefs and foodies will pay up to $20 a pound for them! I found ramps at Whole Foods last Saturday, so I finally got a chance to try them. They really are a beautiful vegetable. They look similar to green onions, only with broad green leaves and deep purple stems. They taste like a cross between an onion and garlic. 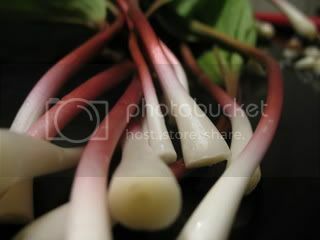 It seems as if ramps are most often sauteed and eaten with pasta or risotto, in soups, or roasted with meats. I took a cue from The Kitchen Sink and made a ramp tart. First, I thawed a sheet of puff pastry, rolled it slightly, scored the edges & forked the middle, brushed it with olive oil, and topped it with about 1 cup of shredded mozzarella cheese. Then, I blanched the whole ramps in boiling water for about 1 minute. I dried them carefully, placed them on the prepared dough, and finished with a sprinkling of grated parmesan cheese (about 1/4 cup), salt, & pepper. 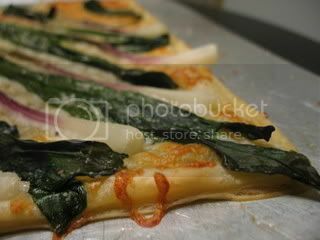 The tart was baked on a sheet pan at 400 for about 10 minutes, until the pastry puffed and the cheese browned slightly. The whole house smelled strongly of onion & garlic, but it was a pleasant--not pungent--aroma. And while this recipe is simple, the ramps packed a pretty powerful punch in the taste department. There was no lack of flavor here. It was a perfectly light dinner with a glass of red wine. Even though I enjoyed my ramp experience and am glad I got to try them to see what all the hype is about, I won't go out of my way next spring to find some. Those really are quite beautiful. And way to use them on the tart. It looks really good. I completely agree! I just got a bunch of ramps because I wanted to see what they tasted like. I sauteed them in garlic as a side. They were good... but not worth the $3.50 I paid for the small bunch. Honestly the garlic chives I also got, had about the same taste. It is fun to be part of the clique though. I have some photos I took here. Thank you for finally explaining what all the ramped up Ramps is about! I have been in the dark and no one has taken the time in their blogs to explain. I will be on the look out for them. Great blog, BTW. your title says it all. i've been thinking the exact same thing, but my local grocery stores aren't carrying them and i have no idea when the local farmers market opens this year. thanks for posting about your experience with them. Your tart looks lovely and I think in order to call myself a true foodie, I should go out and get myself some of these to try as well, worth it or not! Great post! I just found your blog and LOVE it! There are so many food blogs out there, but your recipes are so beautiful... I'm subscribing right now. Came across your wonderful blog on foodbuzz & am a new follower!